One of the major drawbacks of doing this blog thing for fun rather than as a career is that one can only report on what is seen. Hence it is very much to your scribe’s chagrin that the reappearance of a Malta-based Spitfire in the skies has gone unreported on the S&G until now. The celebrated Flying Legends collection of airworthy warbirds, a stalwart of the Duxford-based restoration community, quietly welcomed another Spitfire earlier this summer. We have all become somewhat accustomed to Spitfires being returned to the sky, so unless the Daily Mail makes a song-and-dance about a particular airframe it is very hard to pick them out. This one is a humdinger, however, because it is – on paper at least – a genuine ‘Malta blue’ Spit, flown by a ranking ace of this most heroic theatre of WW2 to make an historic string of victory claims. As a Mk.Vb that was ordered on 23 August 1941, EP122 was one of the fourth batch of Spitfires, numbering 904 aircraft, to be built at the Castle Bromwich Aeroplane Factory. After final assembly in Topicalized fettle, complete with the large chin-mounted air filter, and acceptance onto the RAF strength, this aircraft was then disassembled and crated on 8 June 1942 for shipment to the North African theatre of operations. Shipped to Gibraltar on board the S.S. Guido four days later, EP122 was reassembled and assigned to Malta rather than North Africa, requiring a new coat of paint. As per all Malta aircraft arriving in planned delivery, her factory finish Desert Scheme of Mid-Stone and Dark Brown camouflage over Azure Blue undersurfaces was transformed into the Temperate Sea Scheme of Extra Dark Sea Grey and Slate Grey over Sky. Although the most desperate air fighting over Malta had reached its zenith in April-May 1942, there was still plenty of trade to be had. In June and July the Canadian ace ‘Screwball’ Buerling in particular was busy swatting down German and Italian aircraft with 249 Squadron when EP122 arrived as one of the replacement aircraft flying off HMS Eagle during Operation PINPOINT and was immediately pressed into service with 185 Squadron. In common with other 185 Squadron aircraft, EP122 was given the unit’s distinctive identifying code letters, painted in yellow and in a smaller, squarer font than other units on the Island, which usually carried white letters. With ‘GL’ as the identifying code for 185 Squadron and ‘B’ as the individual aircraft code, EP122 was ready to go into battle. This aircraft became the regular mount of a recently-arrived American volunteer, the teenage Sgt. Claude Weaver III of Oklahoma City. Weaver had enlisted in the Royal Canadian Air Force on 13th February 1941 and, after earning his wings and briefly flying in the UK, he joined No.185 Sqn at Malta in late June, aged 19. Within days of his arrival, on 17 July, Weaver had shot down his first Messerschmitt 109. Flying EP122, he shot down two more 109s on 22 July, followed by another pair the next day and then claimed a half-share in a Ju.88 the day after that – becoming the youngest Allied ‘ace’ of the conflict. He was decorated with the DFM for destroying five enemy fighters and sharing in the destruction of a bomber within a period of one week. His score was up to ten before he was shot down over Sicily in another Spitfire, BR112, and made a force-landing on a beach that was photographed in colour and subsequently fuelled much of the myth behind the ‘blue’ spitfires of Malta. Although captured and taken prisoner-of-war, Weaver later escaped and walked 300 miles before eventually returning to operations with No.403 (RCAF) Sqdn – briefly flying alongside ‘Screwball’ Buerling until the latter was posted for insubordination and conduct unbecoming. Weaver was killed in action over France after his Spitfire Mk.IX was shot down by the Focke-Wulf FW190 of 44-victory ‘ace’ Gerhard Vogt. Baling out of the stricken aircraft, Weaver’s parachute was caught on the Spitfire’s tailwheel and he was dragged to earth, surviving for a few hours despite his terrible injuries. Back in Malta, EP122 meanwhile became the regular mount of Wing Commander J.M. Thompson, C.O. of 185 Squadron in the autumn 1942, who had the aircraft repainted with his personal identification letters of JM-T.
At the beginning of 1943, with the defence of Malta complete and attention turning towards an Allied invasion of Sicily, EP122 was transferred to 1435 Squadron, carrying the code letter ‘L’. On 27 March 1943 it crash-landed on the edge of the cliff at Dwejra Bay, Gozo. EP122 was pushed over the cliff-edge into the bay shortly afterwards. The wreck of EP122 was discovered by divers from the RAF Sub Aqua Club off the coast of Gozo in 1969. She lay under 10 metres of water but was cleaned up and salvaged in the mid-1970s. Eventually the wreck came under the ownership of one of the most celebrated men in the American automotive and aviation community: Tom Friedkin. Friedkin’s father Kenny had become obsessed with flying as a child, after watching a barnstorming display in the early 1920s. He qualified as a pilot at the age of 17 and volunteered to fly with the Royal Air Force in World War 2 – much like Claude Weaver. Pacific Southwest Airlines became California’s main carrier – with a certain style! Kenny Friedkin went on to found Pacific Southwest Airlines after the war only to die from a brain haemorrhage in 1962, the airline being privatised soon afterwards. Among the many knock-on effects that resulted from Kenny Friedkin’s premature demise was that his son, Tom, became not only a serving pilot for the airline but also a member of the Board of Directors. Tom Friedkin’s interests extended beyond aviation, and he used his wealth to race cars alongside his great friend Carroll Shelby. As well as driving, Friedkin owned his own NASCAR team in 1965-69, with cars built by Bill Thomas. In 1969, Shelby introduced Friedkin to representatives of Toyota, which was looking to break into the American automobile market. It was through this introduction that Friedkin established Gulf States Toyota Distributors shortly afterwards. Today, GST regularly features in the annual Forbes list of largest private companies in the USA, with annual revenues in excess of $5bn. As his business flourished, so Friedkin has been able to further indulge his passions for powered sport on land, sea and air – nas well as appearing as a stunt pilot and cameo actor in movies such as Blue Thunder, Firefox and Jaws: The Revenge as well as in Clint Eastwood’s critically acclaimed movies The Rookie and Pale Rider. Throughout nearly 50 years , Tom Friedkin has also played a key role in the restoration, ownership and display of historic aircraft; with Spitfires and the Duxford-based Flying Legends team featuring heavily in that interest. Now in his eighties, Friedkin remains a key player in the global warbird scene and his son, Dan, has followed closely in his father’s footsteps. The restoration of EP122 is the latest in a long line of landmark rebuilds. The initial work was apparently undertaken by Steve Vizard’s VMI Engineering Service at Aldershot in Hampshire before transferring to Airframe Assemblies in Sandown, Surrey. Finally she made her way to the Biggin Hill Heritage Hangar for completion – albeit minus the distinctive tropical air filter. Having made her maiden flight from Biggin Hill in May 2016, EP122 made her airshow debut at the Flying Legends spectacular at Duxford this July. As a result, it will now be possible to see a genuine example of a ‘Malta blue’ Spitfire Mk.V in the air, complete in the colours with which she was flown by a remarkable young American volunteer to write his place in the history of military aviation. Of all the Spitfires airworthy today, this makes EP122 one of the most significant of her breed. Ultimately it must be assumed that EP122 will make her way to the USA but it is to be hoped that, with the 75th anniversary of her accomplishments on the horizon, she will remain long enough to be one of the star performers of the 2017 UK airshow season. Here’s a lovely little video made by the team of warbirds based at that most celebrated of all Battle of Britain airfields, Biggin Hill. One thing it shows – other than the gleaming black hive which houses Bernie Ecclestone’s money factory, Formula One Management, is just how pronounced Biggin’s Hill actually is. 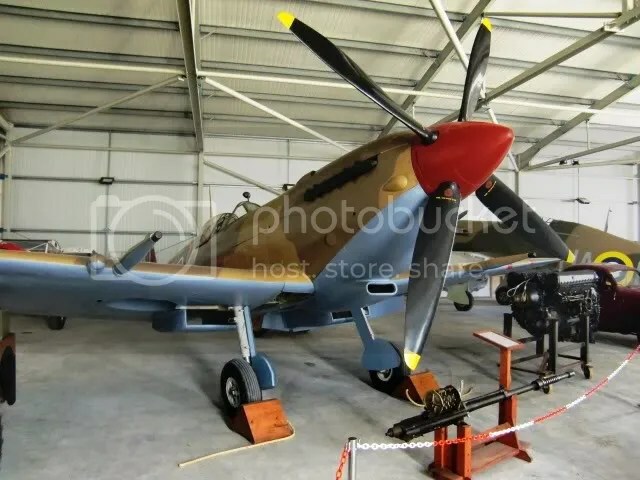 Out in the middle of the Mediterranean you can find a beautiful, locally-restored Mk.IX Spitfire among a wealth of aircraft at the Malta Aviation Museum. This aircraft, serial EN199, was first flown at Eastleigh on 28 November 1942 and within two weeks it was packed aboard the MV Marsa and shipped in a consignment bound for Gibraltar, where it arrived on 13 January 1943 and was quickly reassembled. She was ferried to North Africa on 29 January 1943 and became the personal aircraft of noted ace Wing Commander Ronald ‘Ras’ Berry D.F.C., whose initials were worn as her identifying code the fuselage. She took part in the Allied Operation TORCH landings and subsequent Tunisian campaign and fought on until the Axis surrender in North Africa. She was then flown to Malta in time to take part in Operation HUSKY, the invasion of Sicily with 1435 Squadron, later transferring to 225 Squadron after the allied forces leapfrogged on to the Italian mainland. She survived the rest of the war in Italy and returned to Malta to perform peacetime duties with the Air Sea Rescue & Communications Flight at Hal Far airfield and, later, with 73 Squadron at Luqa – today’s Malta International Airport. EN199 ended her career in a gale, during which she was blown into a ditch at Luqa and struck off charge as being beyond economic repair. Later she was presented to the local Boy Scout troop and from there seemingly got shipped from pillar to post around the Island until 1992, when local historian Ray Polidano gathered up the by-now rather hangdog airframe and started a restoration which saw her reappear in her original desert camouflage colours as ‘Ras’ Berry’s R-B. For more information on the Malta Aviation Museum visit the website. 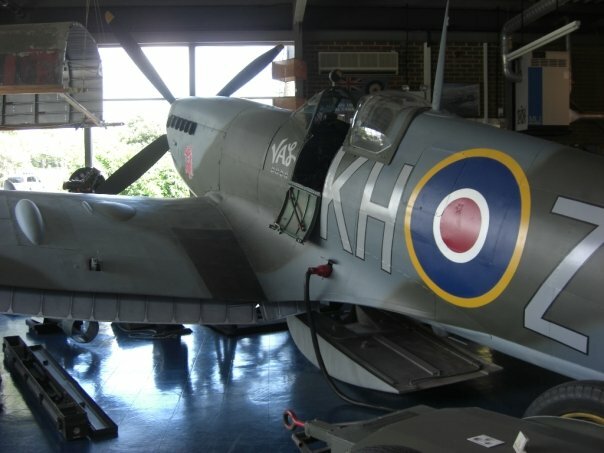 A silver Spitfire – and one of the last, this is F.Mk.24 VN485, which stands today in the Imperial War Museum, Duxford. The Mk.24 was the last of the breed, built in 1946-47, and never saw active service. A decade after the type entered service, and trying to stay on terms with the first generation of jet fighters, the Spitfire Mk.24 had a pressurized cockpit to allow her pilots to reach a ceiling of 43,500 feet, powered by a 2,050 hp Rolls-Royce Griffon with a maximum speed of 454 mph with a service ceiling of 43,500 feet. VN485 was delivered in 1947 and was shipped to Hong Kong in 1950 to join gathering reserves in what was a potential hot spot in the burgeoning Cold War. Hostilities did break out in Asia but on the Korean Peninsular, meaning that none of the Spitfires were needed. The Hong Kong airmen had little to do and life must have been quite pleasant, all things considered. 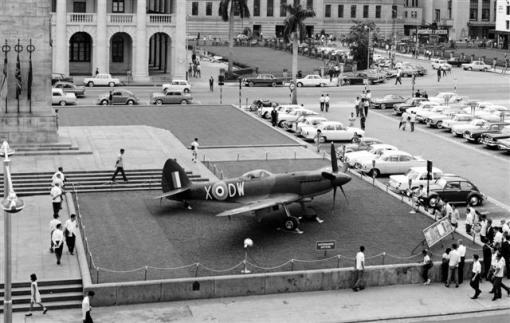 When the Queen visited Hong Kong in April 1955 four of the the local Spitfires – including VN485 – made the last official sortie by the type in RAF service when they performed a flypast before heading into retirement. 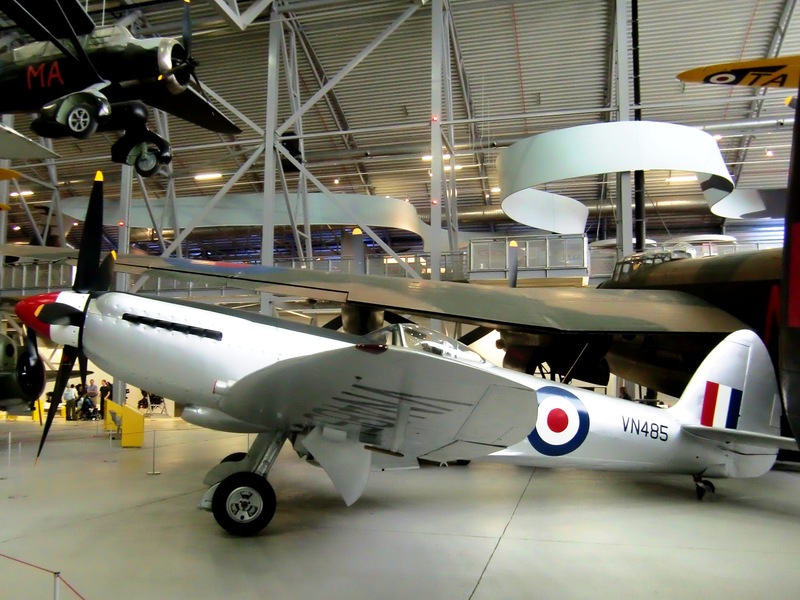 VN485 was placed on display in Hong Kong – being pictured in a replica Battle of Britain livery of 610 Squadron in the mid-1960s – before becoming a gate guardian. She was eventually donated to the Imperial War Museum in 1989 and restored to her 1954-55 colour scheme in 2004. 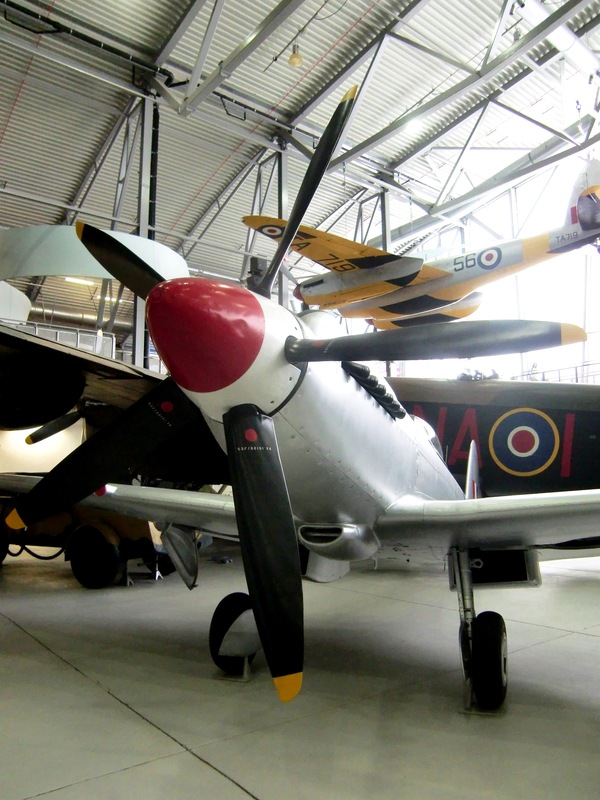 For more information on the Imperial War Museum’s fantastic facilities at Duxford, visit the website. I’ve been to a lot of places to find the aircraft that I love so I’m going to start sticking up the results in new sections on here. Might as well start off with the aircraft that 99.9% of the world wants to see… the Spitfire. This is the ‘high back’ LF.Mk.XVI serial TB752, the ‘Manston Spitfire’. She was built at Castle Bromwich in 1944 but held back until March 1945 before reaching an operational unit – 66 Squadron at RAF Linton-on-Ouse. Just days after arriving she was badly damaged in a landing accident, rebuilt and sent to Diepholz in Germany where she joined 403 ‘Wolf’ Squadron, RCAF and shot down three aircraft. In peacetime ‘752’ suffered a lot of neglect until she was dragged out, tarted up a bit and stuck on a pole as gate guardian at the celebrated Battle of Britain station, RAF Manston, in 1955. The first move to save the old girl from the ravages of the British weather came in 1978, when a year-long 15,000-hour restoration saw her emerge in the condition you see now, in her wartime markings with 403 Squadron. After two years of vigorous fundraising a permanent indoor home was completed for her and the Manston museum got its star exhibit. It’s a great little museum, with very kind and helpful volunteers dotted in every corner. Well worth a day out in the heart of ‘Battle of Britain country’. 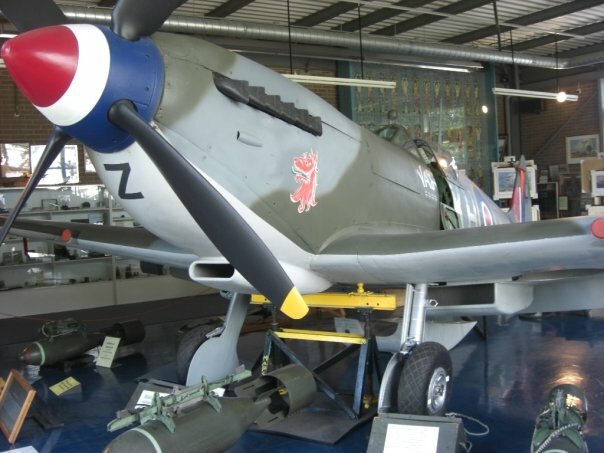 For more info go to the Mantson Spitfire & Hurricane Memorial Museum site.